It is a frightening situation to be trapped in your car during a snowstorm. With poor visibility, it often feels like you're the only one for miles and the prospect of being rescued can seem unlikely. In particularly harsh storms, knowing what to do can save your life. To help you understand the proper steps to take, we've compiled a list of tips on how to respond to being trapped in a car during a blizzard. The first mistake people make is to leave their vehicles and search for help. Unless you can see the lights of a house or another car within 50 metres, you should avoid leaving your car. In a blizzard situation, you can easily become disoriented and unable to reach your car again. Make sure people know that you're in trouble. Put a piece of cloth around the radio antenna to show that you require assistance. Keep your keys close to the ignition so you can flick your lights on and off to alert passing vehicles. Turn the engine on for 10 minutes out of every hour to keep you and the engine block warm. You won't use much fuel and it will ensure that your car will start without much trouble when you manage to get unstuck. 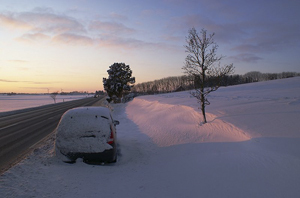 Be sure that your exhaust pipe is not blocked by snow, or you risk carbon monoxide poisoning. Keep your window slightly cracked as an extra precaution. At least once an hour you should move around to keep blood circulation up. Move from the front of the vehicle to the back seat, clap your hands, stomp your feet, or sing and dance to your favourite song. If you're with others, huddle together to keep warm. Be sure to cover yourselves with whatever blankets or jackets you have in order to stave off hypothermia or frostbite.